The Gnosis auction was filled in super quick time. 250,000 ETH (USD 12.5 million @ USD 50 / ETH) was contributed to the GnosisAuction smart contract from 623 unique accounts within 10 minutes and 48 seconds. As the dutch auction model was used, the USD 12.5 million was for less than ~4.17% of the tokens, with the remaining ~95.83%% belonging to the developers and company. This values the total number of tokens at USD 300 million. 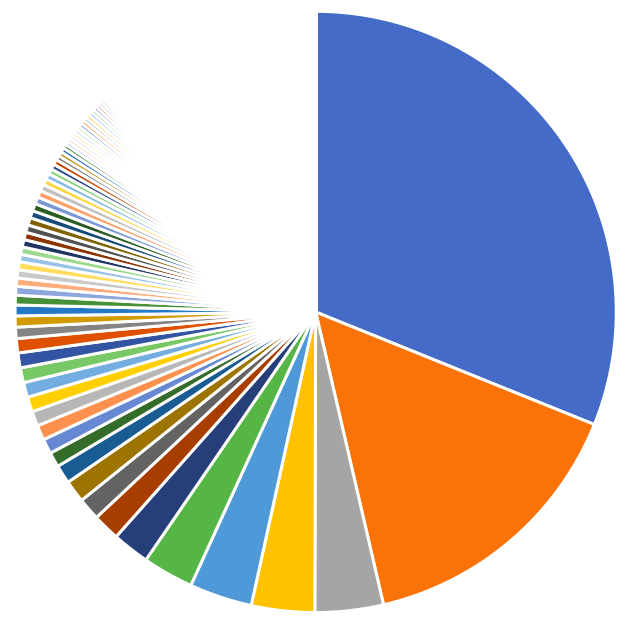 The top 3 contributors making up 50% of the funds had their contribution transactions executed using the same BiddingRing/ProxySender software. And all 3 transaction were within the first minute of the auction commencing. Update 1. 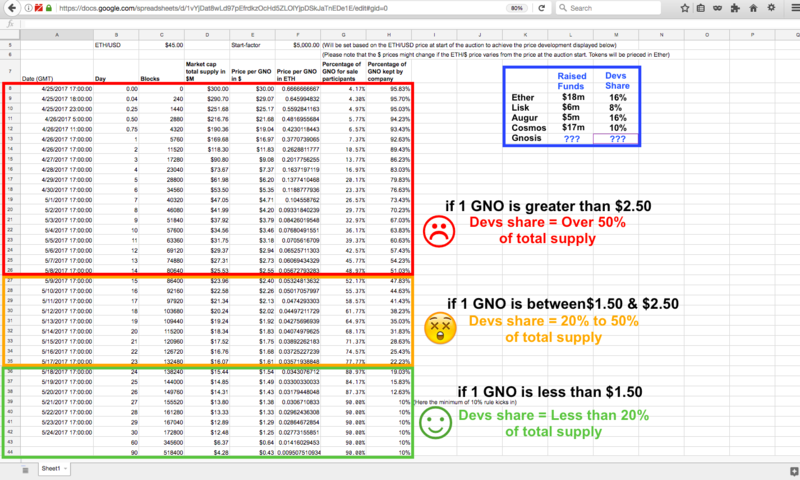 User slacknation has provided the link to the BiddingRing contracts at https://github.com/ConsenSys/gnosis-contracts/blob/bidding_ring/contracts/solidity/DO/BiddingRing.sol. Update 2. User veoxxoev has provided a gist (warning – 12Mb web page) to the list of submitted transactions, including the failed transactions. First transaction at 24 Apr 2017 16:59:01 UTC. Last transaction at 24 Apr 2017 17:09:49 UTC. Duration 10 minutes 48 seconds. The largest account contributed 77,777.70 ETH (USD 3.888 million @ USD 50 / ETH) or 31% of the 250,000 ETH (USD 12.5 million) total. This transaction was executed by the BiddingRing contract at 0xda5c805cfcf76ccc44ba616e0898ef1e33286063, and this was funded by one unique address. The second largest account contribute 38,157.06 ETH (USD 1.907 million) or 15% of the total. This transaction was executed by the ProxySender contract at 0x19076bd01e86fa3d76334e27d4b8e6789688a42d, and this was funded by 327 unique addresses. The third largest account contribute 9,176.82 ETH (USD 458 thousand) or 4% of the total. This transaction was executed by the BiddingRing contract at 0x6dbe4988a9ddd46967bec08c9f2e400ea258d964, and this was funded by 9 unique addresses. The remaining 620 accounts contributed 50% of the total, and from a few of the accounts I checked, the transaction were executed directly to the Gnosis-DutchAuction contract at 0x1d0dcc8d8bcafa8e8502beaeef6cbd49d3affcdc. The BiddingRing contract that the first and third largest contributors was deployed by account 0xb44caabed82251ca7da063e99622a6f1f8104687 in the transactions 0x4f3bab4a… and 0x2013dee2…. The source code for the BiddingRing and ProxySender contracts are included below, and are very similar. A spreadsheet with the results is available from GnoAuctionResults.xlsx. Would a Gnosis Bidding Ring work? Would a Bidding Ring work? geth attach << EOF | grep "RESULT: " | sed "s/RESULT: //"
/// @title Dutch auction contract - distribution of Gnosis tokens using an auction. /// @param _wallet Gnosis wallet. /// @param _ceiling Auction ceiling. /// @param _priceFactor Auction price factor. /// @dev Starts auction and sets startBlock. /// @dev Changes auction ceiling and start price factor before auction is started. /// @param _ceiling Updated auction ceiling. /// @param _priceFactor Updated start price factor. /// @param receiver Tokens will be assigned to this address if set. The BiddingRing contracts was used by the first and third largest contributors and have been deployed to 0xda5c805cfcf76ccc44ba616e0898ef1e33286063 and 0x6dbe4988a9ddd46967bec08c9f2e400ea258d964. Both were deployed by 0xb44caabed82251ca7da063e99622a6f1f8104687. The ProxySender contract was used by the second largest contributor and has been deployed to 0x19076bd01e86fa3d76334e27d4b8e6789688a42d.